I knew from a young age that I never fit in with the other kids. Not only did I sit down in front of Sesame Street but I’d also watch the evening news and The Nightly Business Report when I got a chance. When I was in the library in elementary school, I’d grab whatever reference book or Encyclopedia struck my fancy and go through it until I found something that stood out to me. When my parents got lost behind the wheel, I was the one who knew where we were and which directions would get us back on track. I was intellectually hungry to know how, where, when, why, and what made people tick. Much of that curiosity was satisfied when I went to New York alone for the first time in early ’94 and drove out to California alone a little over two years later. There were no words to describe what it was like to see the words, pictures, and stories in books and depicted on television come to life right in front of me, as I got to use my knowledge and take my learning to another level by experiencing new places firsthand. One of the moments I’ll never forget was the first time I drove out at night alone. I had just gotten my license and a pair of wheels (not much else functioned properly on that vehicle) but on a night not much unlike tonight, I took her out for a spin here in town. It may not have seen like much to anyone else but to be out alone with the buildings illuminated by artificial light, with hardly a soul to be seen, and with the top down on a room-temperature night was something that struck me as totally new and totally comforting at the same time. Most of all, I wasn’t tired like so many people were when they had to be out late for work or socializing. I begged to stay up past my bedtime when I was little to watch Sha-na-na or Dance Fever and even though they had been off the air for years by that point, the little boy that resented going to bed early finally got his due and loved every minute of it. Looking back, it was easy to see why I loved that night and so many others like it since. Every job where I’ve had to be up during the day had been a struggle for me – from getting out of bed, staying awake and alert for the full 8 hours, and conforming to an office environment that never felt quite right, even on the best of days. One thing I learned during the struggles of a daytime vocation was that I had to keep myself stimulated in order to feel alive. No, it didn’t involve illicit substances or death-defying juvenile antics, but I had to read, write, learn, listen, and respond to as much as I could and add it to my base of knowledge, so I could find new fields that explore on my own time. Even with all the books I have here at the house, all the pages bookmarked on my computer, and all the places I’ve been lucky enough to visit in the other 46 States that I don’t regularly get to, there’s so much more out there that I haven’t been able to have my senses come into contact with. The older I get, the more I realize that what I’ve learned will probably pale in comparison with what still currently remains unknown to me. For example, there’s the World Trade Center and a chapter of its history that I only recently started to inquire about further. Several times in the 1980’s, I had the chance to go to the observation decks on the 107th and 110 floors. I remember the absolutely massive escalators leading up from the PATH terminus, the elevators having “Welcome” written in several languages for the tourists, photographs of each of the 4 views with the major buildings highlighted for the sightseers, the electric fence around the edge of the outdoor observation deck to thwart jumpers, and an autograph on the northwest corner of the South Tower, with a simple marking on it. Later on, I realized that someone had crossed between the Towers on wire around the time my parents got married, but I never read any further into it. Three months before I graduated from Columbia, I stumbled into the auditorium at the Student Center where I had reviewed notes for class during many a lazy afternoon. That day, they were screening Man on Wire with a Q and A afterwards with one of the deans. It was free and open to all and even though I missed the first 15 or so minutes of it, I put my books away, sat down, and stayed until the end of the discussion. I would tell everyone out there reading this to go rent it on DVD and watch it straight through, but that’s not why I’m writing this entry today. For starters, this isn’t a blog about movie recommendations and furthermore, I hadn’t been to a theater in years before watching that documentary; so therefore, I have almost nothing to use as a frame of reference. Most people I know have seen so many movies that they know what they like and don’t like and what they think of the most popular films in recent years. I’m the exact opposite as I have little use for Hollywood right now and spend my free time pursuing other forms of mental stimulation. It’s so difficult for me to look at those pictures nearly 40 years later. It’s not because the towers aren’t there anymore, or because the landscape of Lower Manhattan has changed, or the color resolution has changed 1000% for the better, or even because the air of today’s postindustrial Gotham has become cleaner than clean itself. It’s because I keep thinking that he’s absolutely, totally insane for what he did. But there’s no doubt that he isn’t. Sitting on the physical edge of 110-story towers as if it was a simple ledge is something that no one else would ever want to do, but he wanted to do it. He had a goal, a way to attain it, and the patience to follow through. Who am I to criticize him? There was a time when picturing machines heavier than air gliding effortlessly around the world, or messages being sent to anyone, anywhere, anytime at the click of the button, or even diseases invisible to the naked eye being wiped off the face of the Earth would have seen eternally impossible but someone had the courage to challenge the status quo and push the boundaries past the known realm to see these ideas become reality. No matter how preposterous it seemed or how much effort was required to carry out the dream. From what I have read, some have criticized Petit for what they perceive as his enormous ego. I never thought it was big at all and unless one completely clouds out friends, family, and spirituality, it’s almost impossible to have one’s Freudian impulses out of whack. It was ego that sent explorers across the Atlantic in search of riches, new lands to conquer and ultimately, a new home away from crowded, feudal Europe. Ego led to the writing of a document that separated us from a country intent on plundering our wealth of resources instead of treating us as equals under the law. Years later, ego led to the laying out of the “greatest grid” of streets in the greatest city in the republic which had the courage and daring to break away from the largest colonial power the world had ever seen. A few generations later, ego after ego took part in the greatest race for height of the 20th century, which ended in the construction of two massive towers that were over 95% full on the day they were destroyed at the dawn of the 21st century. Each age of individual gain involved less and less physical space that had to be conquered than the one before it but involved more mental blocks that had to be overcome, as the World became smaller over that time but the contents of it became larger and more complex, and therefore, presented more challenges for those that wish to rise over them. All of this came to a head on August 8, 1974 as millions watched mesmerized during Petit’s 8 walks back and forth between the towers over a 45 minute span. One Police Officer who watched knew that he’d never see anything like it again but little did he know how utterly prophetic his words were. It was apparent that day that no one would ever string a wire between the towers and use them as a means of crossing the 1,300-plus foot height of their rooflines again. What was not obvious that day was that we’d never push a boundary like that on U.S. soil in anyone’s lifetime. Sure, new companies have been formed and new inventions have come along that have revolutionized the workplace, the standard of living, and the way people interact with one another, but so much has changed in this country that it’s increasingly hard for one big idea or one big person to come along and challenge the conventional wisdom of the day. Groupthink, conformity, increased domestic surveillance, and a security state have all led to a dearth of creativity that will hurt America for generations to come; assuming that the Republic even survives in its current state for that long. Toss in another fiscal collapse similar to what happened 5 years ago and it could be the end our way of life forever. A few weeks ago, I went into Bryant Park after a night out at work which saw me interact with the usual cast of characters that I come across during a typical shift. None of them measured up to the person I had gone to see in the reading room that day. Vivacious, humorous, and uplifting, the 63 year-old that spoke that sunny afternoon was there to promote his latest book, which dealt with knots. 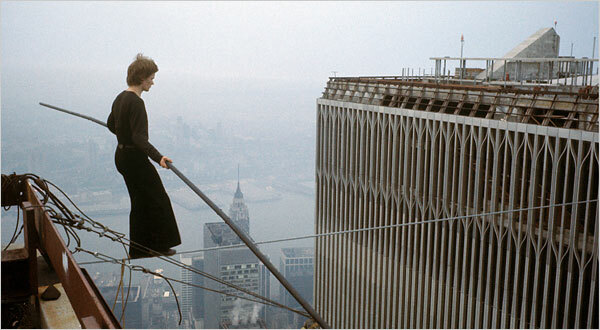 Seems like a simple premise until you realized that the person had been tying and retying knots for decades and that that person was none other than Philippe Petit himself. It was one of those days that stuck with me for a long time after I paid for Why Knot? and To Reach the Clouds. Once again, something that I had only seem in film and print had come to life before my eyes, much as the places in New York and America had for me during my jaunts away from my cozy suburban abode. The crowd that grew was much larger than anyone had anticipated as those walking by through the park or on their way back to the office after lunch realized who was speaking and how he had everyone’s attention who was in attendance. Most striking of all were how many people that were in the park that day were *not* aware of the speaker at all but rather, were on their phone/Blackberry or idling the time away in the midst of a presentation by one of the most engaging personalities ever to set foot in the Big Apple. When it came time for me to have the books autographed by him, I mentioned that I was surprised that he wasn’t left-handed. Not only is yours truly sinister in the way my brain is wired, but nearly all of the women that I’ve most admired and have been attracted to over the years and many of the notables that I’ve emulated were in the minority when it came to which hand they’d place a writing utensil in. Philippe mentioned that he was indeed right handed but thought of himself as more ambidextrous than just about anyone else. Surely, who would argue with that? Before I left to shoot my first rounds of Petanque in weeks, I told him wholeheartedly that he was beloved in New York. While I’m sure he’s been told that more times than I could count, I’m sure it’s something that one would never get tired of hearing. Personally, it would be something I’d want have someone tell me, though I wouldn’t be sure for exactly what I had done with my life and my God-given talents. And that’s where the problem lies. The old Chinese saying is that a journey of a thousand miles begins with single step and for me, the problem is figuring out what direction that, and the thousands of others that come past it, would be in. Years of reading, writing, and schooling have shown me that for all that I know and have codified, that there’s much out there that I have yet to learn and accomplish. Every time I think about how hard it is, I pull up the picture of the view down from the South Tower of the World Trade Center as Petit took his first step and danced among the clouds on that Summer morning decades ago. I’d give anything to experience that feeling for myself someday. Sure enough, it was fireworks coming from the direction of the Sheep Meadow. After I dropped off this passenger, I soon found out from my next fare that the Philharmonic was playing in the park that night and as an attempt to draw more patrons in, a post-concert pyrotechnics display concluded the night’s festivities. Although it paled in comparison to the show that Macy’s put on two weeks earlier, it was certainly enough to get my attention as well as everyone else’s who happened to be shooting crosstown on 57 St.
With so much going on in the Big Apple, I incorrectly guessed the reason for the visual and aural display. Every week, there’s another parade, festival, or commemoration for a person, anniversary, or country and one of the perks of working in the Big Apple is that every nation on Earth gets its moment in the sun at least once a year. It may be overkill at times and a pain when major streets in the city get blocked off, but they all serve as reminders that we’re a nation of immigrants that came here in search of a better life. Loosely translated, it means “feet grounded” and is a game similar to bocce; except that it’s not. I only started playing two years ago and like so many others in New York that take up a sport as a form of recreation, I picked it up off of the street…er, park. 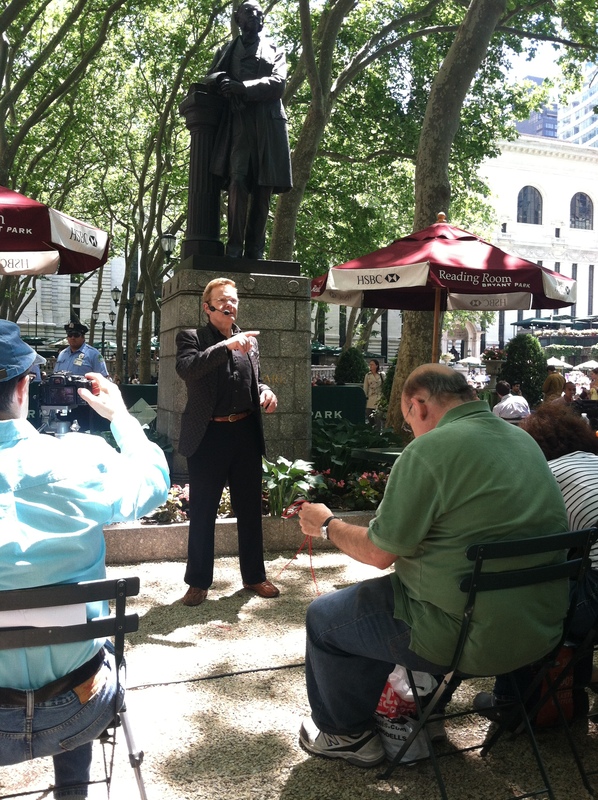 Long before I stopped cursing at Yellow cabs and actually drove one for a living, I passed through Bryant Park. I didn’t recall what it was like in the 1980’s since like Times Square, it was an area to be avoided at all costs. However, the 1992 renovation brought new life to the space and the inclusion of a reading room, public restroom, and great lawn made the place ideal for passing through at all times of the day. Every time I left the Bus Terminal, I passed through it to reach most of Midtown; even if I had to go a little bit out of my way. Over the years, it became the start of many of my pavement-pounding days and it eventually became the nexus of my outdoor time in New York. The grid that had defined the street layout in New York was continued inside the park, as the rows of trees, pathways, and a centrally-placed fountain brought out the best in French landscape architecture, while allowing for lots of fauna to fill in the spaces and throw in just a hint of disorder to the regimented layout. Of course, what would suit a place like this better than a game that was French in origin? The few times I saw players partaking in it, they were old and looked like the bowlers that were in my leagues back in the day here in Jersey. For years, I was called “kid” every time I burned the other team or made 6 spares in a row and that’s how I felt here, watching the seasoned veterans battle each other out boule after boule. Like so much in life, I decided to give it a go one day, when the sun was shining bright and I didn’t have the weight of the academic world at Columbia weighing me down anymore. I walked over, signed up for a free lesson, and started tossing the metal balls at the jack one at a time, when it was my turn. As as they say, the rest was history. Like so much in life, it quietly grew on me. One session turned into a few weekly practices and eventually, I joined LBNY. For someone who didn’t have a home in New York until I drove one figuratively on wheels, the game gave me a reprieve from the City that turned out to be one of cold shoulders, instead of big ones. To be fair, many of the players were French and had the game ingrained in their blood but over time, I found out that the diversity of the players was as great as the city itself. Young, old, working, retired, near, and far – it didn’t make a difference. 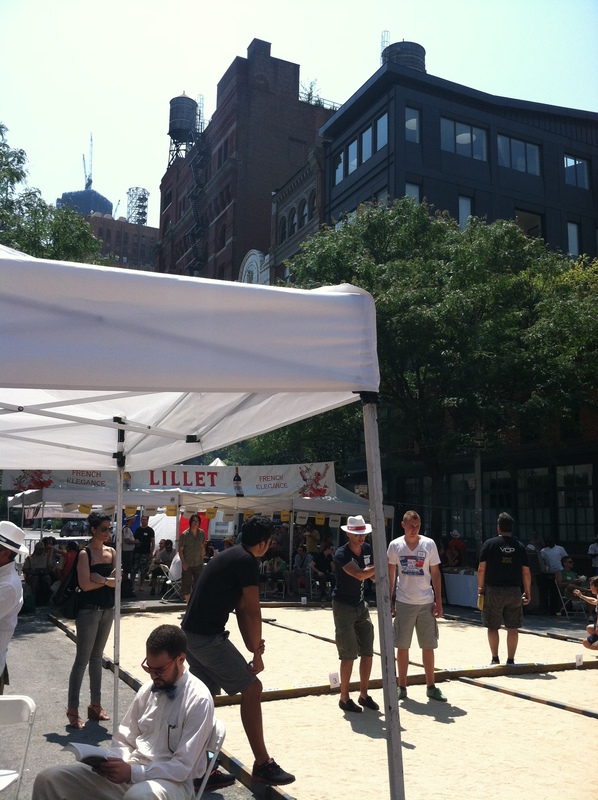 The game quickly became greater than the sum of its parts players and soon enough, I found myself with boules in tow going around the city for a bunch of tournaments. 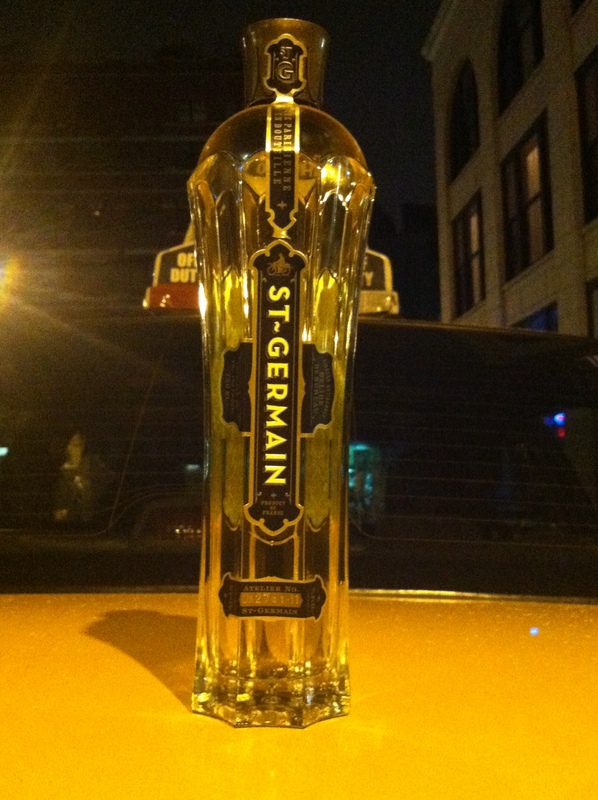 None of which was greater than those clustered around Bastille Day. My textbooks at school taught me that the Bastille was a French prison that was stormed in 1789 and set off the waves of revolutions that led to the modern-day republic. The tournaments I attended did have a guillotine for display purposes but focused more on modern culture and French-inspired jazz that has been overlooked in this country. To be fair, I knew that I was a neophyte at the game and a majority of the players who excelled at it spoke French and exhibited the customs of it during the games. Sure enough, that rubbed off on me too. 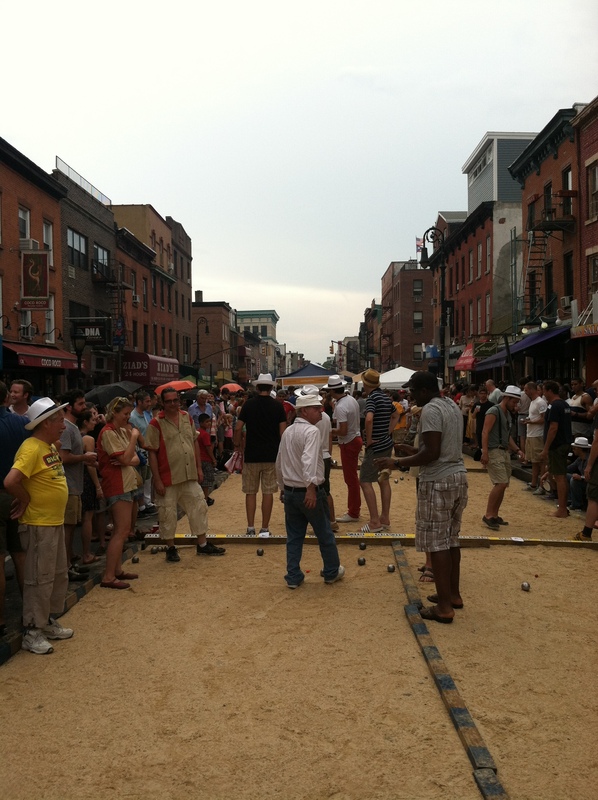 For all of its similarities to lawn bowling, Petanque is indeed an egalitarian game. What’s in? What’s out? You moved! I did not. My boule is closer! Oh yeah? Just like cabdriving, it’s a mindset that seemed so alien to me until I played competitively and started to act like everyone else. New York excels at taking people from all corners of the globe and making them assimilate with their peers, if they choose not to self-segregate and not selectively associate with others of their own race or background. Since I grew up in such a homogenous place, it was easy for me to adapt to my surroundings when I left here, since I never really had a tie to where I came from. It’s probably why I’ve always liked seeing new neighborhoods and places when I was on wheels, even though I stuck out like a sore thumb quite often. 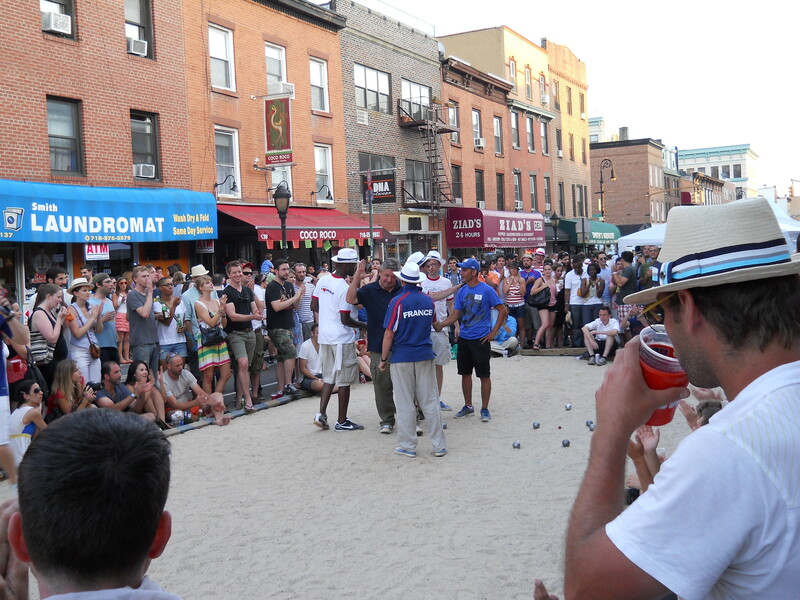 Last week was the one where all of this year’s Bastille Tournaments took place and of course, I hung up my keys for a few days and reacquainted myself with tossing the boules on sand. I said “fromage”, puckered up for some Ricard, and to be fair, did my fair share of arguing and belting out our point total in French after enough hard-fought rounds. It was hard to believe that I was on streets that I had passed through time and time again after dropping fares off, only because I was on the other end of the street closings that harden both the urban and my physical arteries when the days get long. No matter – there weren’t any trophies in it for me this year but once the games were over, any animosity I felt towards any players went by the wayside and my next shift at work was just that much easier to handle once I pulled out of the garage. Sure enough it did, considering that those words came from Al Roker’s mouth. Laissez les bons temps rouler.